Orville Armbrust was born on Monday, March 2, 1908, in Beirne, Arkansas. Armbrust was 26 years old when he broke into the big leagues on September 18, 1934, with the Washington Senators. His biographical data, year-by-year hitting stats, fielding stats, pitching stats (where applicable), career totals, uniform numbers, salary data and miscellaneous items-of-interest are presented by Baseball Almanac on this comprehensive Orville Armbrust baseball stats page. Orville Martin Armbrust was a Major League Baseball player who pitched for the Washington Senators ( 1934 ). 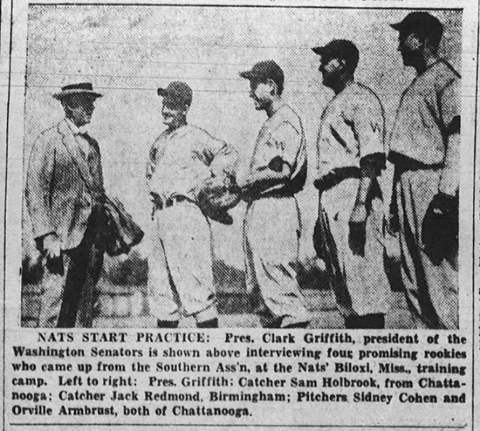 When Armbrust made his big league debut on September 18, 1934 , he became the first big leaguer from the small logging town of Bierne ( Arkansas ). Did you know that when Orville Armbrust made his last big league start, on September 30, 1934 , he faced a Yankee starting lineup that included eight All-Stars; Frankie Crosetti , Red Rolfe , Bambino's , Lou Gehrig , George Selkirk , Tony Lazzeri , Ben Chapman , Arndt Jorgens , and Red Ruffing ? Armbrust pitched seven innings, surrendered seven hits, three earned runs, and beat the Bronx Bombers for his only career win .